Back at Computex, Intel announced its new high-end desktop (HEDT) platform code named Basin Falls. There are three elements to Basin Falls: the new X299 chipset which brings a number of enhancements from the more mainstream consumer line, a set of Skylake-X processors based on the Skylake-SP microarchitecture (and slightly different from the mainstream Skylake-S processors launched in 2015) from 6 cores to 18 cores, and a pair of Kaby Lake-X processors, reusing the Kaby Lake-S silicon launched earlier this year but with a bit more frequency and power consumption. We covered all three parts in our launch pieces (linked below), but here is a quick recap. The main reasons an enthusiast invests in the HEDT platform usually revolve around multi-threaded performance, the need to support multiple graphics cards, and potentially 1.21 jiggabytes of DRAM (ed: you mean 128GB). 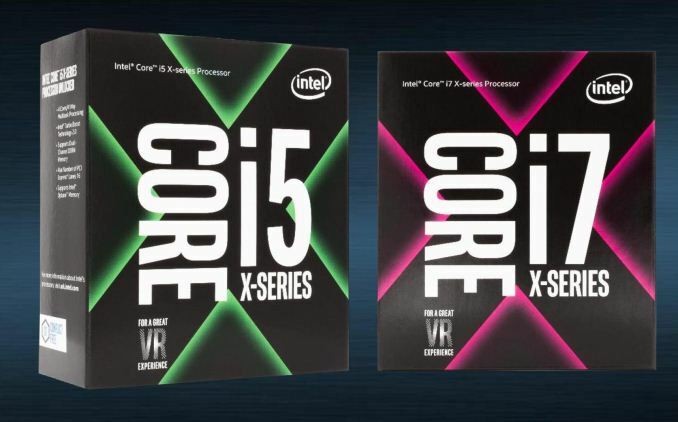 Kaby Lake-X (KBL-X for short) doesn’t have any of these features that we normally prescribe to HEDT: it only has four cores, not ten or higher; it only supports one GPU at full PCIe speed, up to two in SLI or three in Crossfire if you are willing to have a lower link speed; and it only has dual channel memory for a maximum of 64GB. So why is Intel bringing KBL-X to HEDT? The answer lies primarily in peak performance. Users that have been in the enthusiast space will have realized that the Holy Grail for PC performance is single threaded (ST) performance. If you master single thread throughput, then arguably the rest is easier, such as scaling out to more cores. There are usually three barriers to high ST-perf: instructions per clock (IPC), frequency and power consumption. A high IPC is fundamental to such a design, as any gains will propagate through the platform, but is becoming a tough job. Over the last few generations, Intel has increased IPC by 3-10% each generation, making a 30-45% increase since 2010 and Sandy Bridge depending on the benchmark, but we’re unlikely to see 50-100% jumps per generation any time soon. Any IPC gains are multiplied through the frequency at which the processor runs at, which can be limited by a combination of things: production process (e.g 14nm), voltage characteristics, stability, yield etc. These features tie directly into power consumption, which increases as a square of voltage and with frequency/capacitance. With some designs, +10% frequency might be possible, but at the cost of +100% power, so there also needs to be a balance to have something marketable that people will want to buy. Kaby Lake-X is binding Intel’s latest x86 microarchitecture with the highest IPC, at the highest frequency they have ever launched a consumer CPU, for a reasonable power window. Users can overclock another 10% fairly easily, for a slight increase in power. Simply put, Kaby Lake-X is the highest single-thread performing x86 processor out-of-the-box that exists. This is a different take on HEDT compared to previous generations of HEDT CPUs. With the extra single thread performance, it would appear to appeal to traders who need fast systems, gamers where single thread performance is limiting the frame rate (or minimum frame rates), or science/enterprise workloads where serial code is a limiting factor for simulations or professional applications. At the heart, the new KBL-X processors are no different to their mainstream platform KBL-S brethren. The silicon is the same, but potentially binned for a better voltage/frequency curve, and then packaged into the HEDT platform rather than the mainstream platform. Unlike the mainstream processor stack though, Intel is only launching two processors. 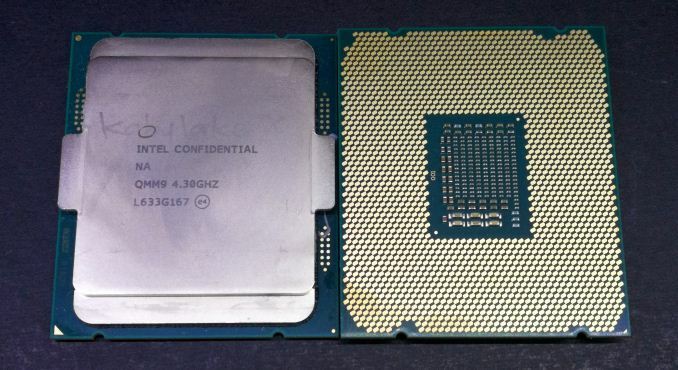 A Core i7-7740X and a Core i5-7640X. Both CPUs are quad core, with the Core i7 having Hyperthreading for a total of eight threads. The Core i5 does not have hyperthreading, making it the first HEDT processor in the modern Core era to do so. Both will have identical support to their KBL-S siblings, although the increased base/turbo frequencies have resulted in Intel’s TDP increasing from 95W to 112W. The TDP rating is a guide for appropriate cooling: the KBL-S processors were actually very good on their power consumption at stock frequencies, and as shown later, so are the KBL-X processors. Intel could have kept the 95W TDP rating very easily here. Intel’s official line is about giving customers options. 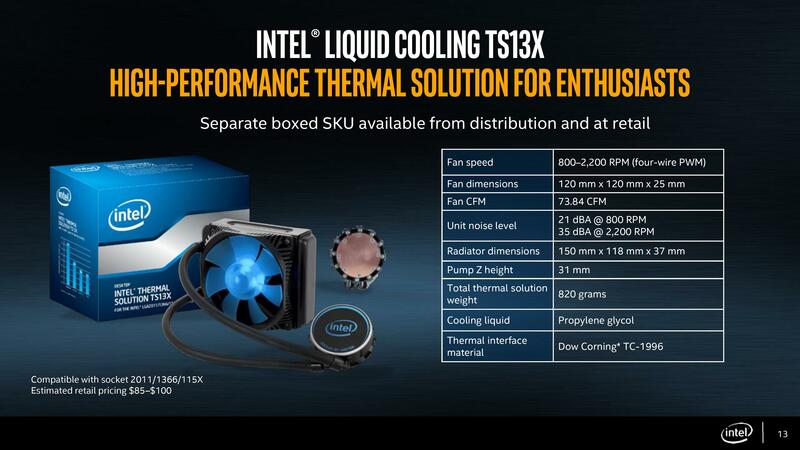 We will not be seeing a Core i3 on HEDT any time soon, though. Kaby Lake-X does not come with any bundled cooler, but Intel is promoting its own TS13X liquid cooled loop with the processors. This CLC has been in the market for a good number of years now. Because these new KBL-X parts are updates to the KBL-S family, Intel has direct competition with itself. The Core i7-7740X is an alternative to the Core i7-7700K on the mainstream platform, being similar in frequency but giving much higher platform costs. Similar platform builds for the two put an extra $100-150 cost on the motherboard, potentially limiting the usefulness of the new KBL-X parts on paper, as that extra cost of the build as a whole might not warrant another 100 MHz on the turbo frequency. The proof is in the pudding, which is why we are doing this review. The Core i5-7640X against the Core i5-7600K is in a similar situation. However, there is also AMD to discuss. With the launch of the Ryzen family of processors, There are now significant comparisons to be made between what Intel offers and what AMD offers. Going at a price-for-price comparison, using MSRP prices (not sale prices or distributor prices), the Core i7-7740X squares against AMD’s Ryzen 7 1700. At this price, both sides have their merits. Intel wins in IPC, which is about 5-15% ahead clock-for-clock, but is also at a higher frequency compounding the difference. In its own attack, AMD wins in cores and threads, offering eight cores and sixteen threads where Intel only offers four cores and eight threads. Intel wins for the IO and chipset, offering 24 PCIe 3.0 lanes for USB 3.1/SATA/Ethernet/storage, while AMD is limited on that front, having 8 PCIe 2.0 from the chipset. Depending on the workload, both sides have merits – AMD will state that it is geared towards more professional multi-threaded workloads, while Intel is geared towards serial code scenarios which still dominate certain tasks. There’s also the platform cost, where the motherboards are $150-$200 cheaper for AMD when looking at cheap overclockable systems. For the Core i5-7640X, it sits at a similar price to AMD’s Ryzen 5 1600X. For this review, we have also included numbers for other processors. These include AMD’s Ryzen 7 1800X, which at $499 is an alternative due to the money saved by investing on the AM4 platform; we also have the Skylake-X based Core i7-7800X, which has an MSRP not so far away from the i7-7740X, and opens up the platform with more PCIe lanes, two more cores, but at the expense of single thread performance; and finally the perennial Core i7-2600K from the Sandy Bridge era, for the benchmarks which we have data. Given everything said above, it would appear Intel has an uphill struggle to convince users that Kaby Lake-X is worth the investment. In this review we will test and see what the performance story is. Please note that our AMD data is before AGESA 1.0.0.6. We are planning an article with an update of the latest AGESA soon.